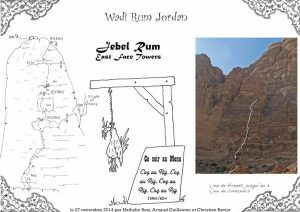 The Main East Face of Jebel Rum – just called The East Face – offers a plethora of climbs. You have the largest number of climbs on one and same face – perhaps the most spectacular of the massif. It is also the closest to the village, with a perfect view of the coveted goals. There are great routes, most often on good to very good rock, with an “entry ticket” around 6b trad for those which reach the top, and 5c/6a for the short climbs at the base. The face also holds a record – that of the number of World Classics – long or short! Oriented full East, it is in the shade in the afternoon only. – Massilia Slab System (E) – short climb. C.Bignon on solo ascent – Jan 2000 – 70 m – 2 pitches – 6a. Afternoon shade. P1 (35m) – 5b & 5c, superb crack and corner. Belay: 1 sling + 1 peg. P2 (35m) – 5c & 6a, overhang & slab. 5 slings in situ. Take 2/3 pegs. Belay on 2 slings. Descent: by 2 X 35m abseils on good belay anchors. – Coq au riz, coq au riz ! (E) – Chicken rice… Short climb. The current local daily meal, which might give you the wonderful idea of… hanging that bloody animal! A.Guillaume, C.Ravier & N.Ruiz – 27/11/2014 – 130 m – 3 pitches – 6b+. Afternoon shade. Descent: by abseiling on the good belay anchors of Mumkin/IBM (see T.Howard’s Guidebook). – Inferno (E) – the short climb of Towering Inferno. W.Colonna & .Howard – 13/10/1986 -120m – 4 pitches – 6b max (E3 5c). Very good protection. Glue-in ring belays & abseils (3 with a 50m rope). Afternoon shade. * P3 + P4 = possible in one single long pitch. – Walk like an Egyptian (E) – short climb. G.Claye & W.Colonna – 23/10/1986 – 70m – 4 pitches – 5b/c. Afternoon shade. These 4 pitches join the “1st floor” of Inferno, which is used for the descent. After the approach in poor rock, two pitches follow in a hidden chimney, a bit strenuous. 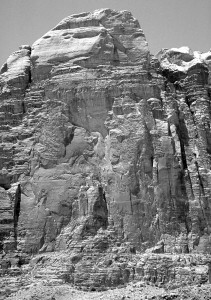 A beautiful exposed, but short traverse in P4 (5b) crosses the base of the “Mumiya” (The Mummy) to connect with Inferno. 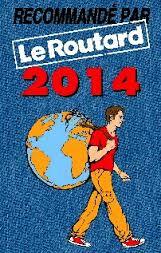 – Troubadour (E) – short climb. 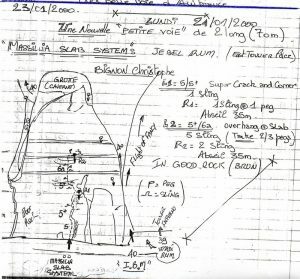 W.Colonna & .Howard – 04/10/1986 – 70m – 2 pitches – 6b/6b+ (5.10d). Excellent protection. Afternoon shade. Descent: by 2 or 3x raps down the route on glue-in ring stations. The essential is done in a pure corner on perfect rock. Graded 6a+ on the first ascent, this rectilinear crack feels more like a big “6b crack” (P2), where the adding of that + is valid for the placement in good style of the pro – which can be energy consuming if you are not well-organized with the gear…. Succeeding here augurs a promising future in the other pure-crack offers of the massif. Take a choice of cams – like BD from 0,3 to 3 (1 to 3 in double, triple for n°2) – and a set of nuts. * An extension has been added. The superb 45m pitch of Droit au But II, at 6c with 9 bolts. Take also few cams and wires for the upper part. Two styles, one route ( Berna, T. Collet, B. Kempf – 2007). * The final belay can also be reached from the right, from the top of the Goldfinger Tower, by Les Filoux at 5a and a bit sandy (by the same team). – Wall of Lace (E) – short climb. W.Colonna & .Howard – 13/04/1987 – 70m – 3 pitches – 5b. Afternoon shade. Descent: by 2x raps down Troubadour (n°65) on glue-in ring stations. It looks and sounds fragile! Despite this wind-borne macrame that raises some doubt, the whole thing is quite pleasant. Not too difficult and can be protected by small threads – with “laces” to be placed with meticulousness. Climb with care. – Goldfinger (E) – short climb. G.Claye & W.Colonna – 23/10/1986 – 90m – 4 pitches – 5c/6a. Afternoon shade. Descent: by 2x raps down Troubadour (n°64) on glue-in ring stations. Good introduction for the climber already at ease on 6a trad and who wants to test his skills in this uncommon environment. The approach to the interesting pitches is on poor rock and requires attention. Don’t let this first impression confuse you. This is where it happens for the main routes that reach the top – at least five of them. With a confirmed level of 6c trad, you can approach them almost all with confidence. Except of course for Rock Empire, much more difficult. Arthur’s Hammer is a real nugget and Ziggurat is a must for the aficionado of knife-cut cracks. This sector is a remarkable showcase. British, French, Spanish, Italian, Czech, Swiss and Germans did first ascents – proof of its attractiveness. W.Colonna & A.Howard – 05/05/1986 – 450m – 16 pitches – 6b – TDsup. 16 pitches / 6b max – 450 m, TDsup. Afternoon in the shade. This water-line gives a splendid and independent itinerary up to the huge terraces of the Champs Elysées, then joining Atalla, which later became Raid mit the Camel, for a common exit of all routes to the summit. Many beautiful and varied passages, in generally good to excellent rock. This is the most affordable offer on the East Face. But its adventurous character should not be underestimated, as should the options for reaching the ultimate top exit crack. Very good protection, with only one or two more committing sections (final long traverse on P2, and P6 for the Glass-tube Chimney). * The climb can be shortened by abseiling from the lower ledges of the Champs-Elysées in order to catch the glue-in rings stations of the Mano Negra at Good Dope Ledge. This seems to be the most common way to do the route. – Rainbow Warrior (E) – it is the short climb of Aquarius for the first 3 or 4 pitches. W.Colonna & A.Howard – 07/05/1986 – 120m – 3/4 pitches – 6b (E3 5c). Afternoon shade.